Jeff Swope came to work at Treasure Valley Plumbing and Drain Services in February 2016. Previously, Jeff was in the customer service in the HVAC industry. 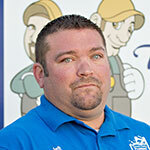 We are excited to have Jeff join our team as a Plumbing Apprentice and knew he would fit right in. Jeff has been a long time friend of the family and lives in Fruitland with his wife and two daughters. They enjoy all outdoor activities like camping and fishing, and they are big Football fans. Preparing their daughters for a successful future is their goal. Jeff says he’d like to retire someplace where there are NO Flies!! Good luck with that one, Jeff! Jeff Swope is starting his first year of plumbing apprentice school in Fall 2016, and we are glad he has joined our fantastic team of service techs.